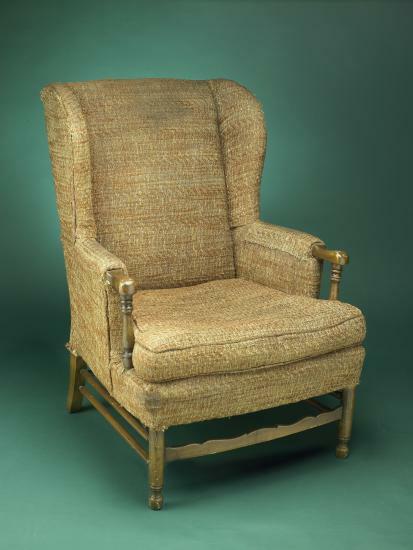 The humble chair has long been the subject of invention and reinvention. From reclining and office chairs to today's ever-shrinking airline seats, designers have wrestled with ways to make it more appealing to the eye, more compact, more ergonomic, but, regrettably, hardly more comfortable. Some designs really push the envelope, even challenging what it means to be a chair. One such example that I recently encountered is designer Jeremy Alden's "50 Dozen" chair, featured in the Baltimore Museum of Art's celebration of the opening of its new American wing with a program called "10 Chairs." Jeremy Alden. "50 Dozen." Baltimore Museum of Art. 2008. Pencils, adhesive. 31 5/8 inches high. The Baltimore Museum of Art, BMA 2008.85. Purchased in Memory of Robert M. Thomas, President, Board of Trustees, 1982-1984; and Lilian Sarah Greif Bequest Fund ©Jeremy Alden. Precisely 10 chairs were singled out from the museum's collections for interpretive commentary by 10 speakers from disparate disciplines. The pre-selected chairs, ranging from the 18th to the 21st centuries, were made in a wide range of materials and styles. I was challenged to comment on Alden's "50 Dozen" from the perspective of the history of invention. Jeremy Alden, of J Alden Design, in Albany, Oregon, designed "50 Dozen" in 2005. The name refers to the 600 Dixon Ticonderoga No. 2 graphite pencils from which it is solely constructed, bonded together not by nails but by adhesive. It first struck me as fascinating but bizarre. Can you actually sit on a chair made of 600 No. 2 pencils? Would it break? I wouldn't try it, even if the museum's security officers had allowed, but Jeremy Alden says he did and it didn't, and I'll take his word for it. On further reflection, however, I found in it a variety of messages from both the past and the future. Clearly "50 Dozen" was intended more as a symbolic statement than feat of engineering. Jeremy Alden describes his designs "as counterpoint to a culture of intended obsolescence," creating "objects with intrinsic value; products that transcend function and strike universal chords." Perhaps we can see this philosophy at work in "50 Dozen." The modern chair and the modern pencil combine apparent simplicity of form with extraordinary complexity and sophistication. Both exemplify themes of modern design, industry, and culture. What happens when the two artifacts come together, as they do in Alden's "50 Dozen" chair? 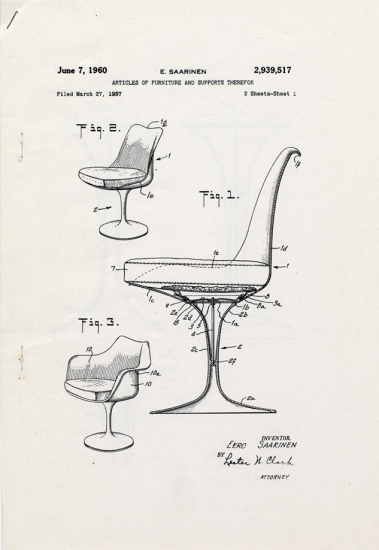 1957 patent drawing for Eero Saarinen chair. US Patent and Trademark Office. Both the chair and the pencil have ancient lineages. But they say something both real and symbolic about our modern world of style and invention. In my view, Alden's chair puts them together in an especially interesting way. While ancient in origin, the chair was dear to the hearts of modernist designers, artists, and particularly architects because of its structural integrity: Frank Lloyd Wright, Eero Saarinen, Charles Eames, Frank Gehry, Richard Meier, Alvar Aalto, Le Corbusier, Ludwig Mies van der Rohe, Richard Neutra, Oscar Niemeyer—all had their versions. What architect did NOT have a chair? Saarinen, Eames, and many others were known for patented chair designs and technology—fast company indeed for Jeremy Alden! What were the desired features of these modern chairs? They had to be beautiful, structural, and simple. They had to be mass producible, or at least suggest that they could be machine-made. New/unusual materials were critical. They had to look and "feel" modern—streamlined, geometric, and not too comfortable, which might signify compromise. In short, they had to look cool and futuristic. 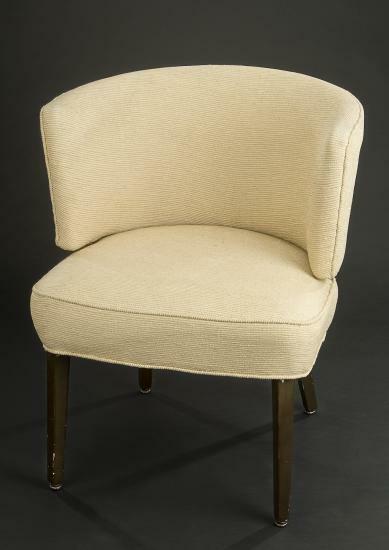 This beige upholstered chair with its deeply curved back was among the furnishings in first-class luxury accommodations aboard the ocean liner SS United States. Launched in 1952, the ship was known for its metallic, modern décor. Like the chair, the pencil's origins go back to Greek and Roman times, but its form has not caught the imagination of designers in the same way as the chair. Still, the pencil experienced a relatively short and lively modern arc, coinciding with industrial mechanization. The Dixon-Ticonderoga company that made "50 Dozen's" pencils has a deep pedigree, traced back to the Joseph Dixon Crucible Company, one of the early manufacturers of pencils in the U.S., founded in 1827 in Jersey City. Pencils are quintessential artifacts of mass-production and pencil manufacturers were among the pioneers of the 19th century industrial revolution. What does all this mean? Luckily, the pencil has its bard. 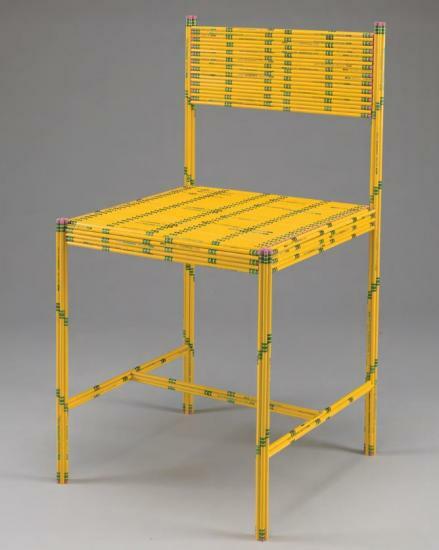 On first glimpsing Alden's pencil chair, I pulled down my copy of Henry Petroski's definitive history, The Pencil. He sings its praises as a marvel of chemical and mechanical precision and complexity, hallmark of the industrial age, and as a unique window on engineering innovation. For him, it is the epitome of mass production and engineering. "[The pencil] is taken for granted," Petroski argues, "because it is abundant, inexpensive, and as familiar as speech." Yet, he insists, "There is much to be learned from the Pencil... about the nature of engineering and engineers... It can be as powerful a metaphor as a pen, as rich a symbol as the flag." Metal pencil box in the museum’s collection. 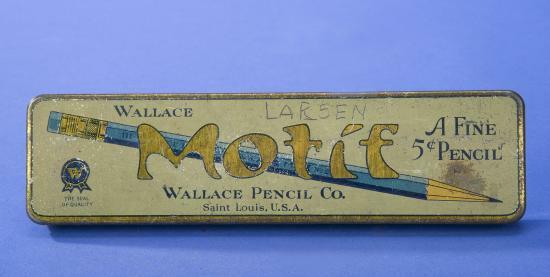 The Wallace Pencil Company began manufacturing wooden pencils in St. Louis in 1915. By 1979, it sold 120 million pencils per year. Dixon Ticonderoga acquired the firm in the 1980s. It is this metaphorical dimension that I find most compelling. The pencil has become a sign of creativity, invention, and innovation. It is the doodler's and inventor's favored instrument, a tool for emerging concepts, the one you use to sketch, erase, and redraw. Along with the light bulb, it is the emblem of inventive and creative thinking. It is nothing less than the extension of our hands and minds. In his path-breaking book, The Hand, neurologist Frank Wilson sees the hand and its capabilities as critical to the evolution of our brains and the authentic root of our creativity. He urges us to stick as much as possible to the pencil and to avoid digital crutches like drawing software. In thinking specifically about "50 Dozen," however, the great Swiss art historian Sigfried Giedion helped me appreciate the chair's cultural significance. Giedion was a major booster of the reputations of Corbusier, Walter Gropius, and the Bauhaus, and, at the same time, a philosopher of everyday objects. Many a curator still keeps a well-worn copy of his book, Mechanization Takes Command: A Contribution to Anonymous History, at hand. Conceived in the 1930s heyday of modernism, Giedion's book was finally published in 1948. It is a paean to the mass-produced. The world of common things, like modern bathtubs, locks, chairs, and pencils, are his turf. In their very commonness, Giedion discovered ineffable beauty, wonder, mystery, and spirit. Ultimately, his goal was to put the soul back into technology and its artifacts, arguing that we neglect or subvert this soul to our own peril as human beings. Failing in this, we will become slaves to our machines and mechanization will indeed command us. More than a decade ago, when I was writing about Giedion, I visited his archives in Zurich, Switzerland. There among the papers, I found American patent models, of which he was fond, including a patent model of a reclining chair. A neo-Hegelian at heart—and thus kindred spirit to Transcendental Idealists like Thoreau—Giedion gazed into the souls of chairs, pencils, and other everyday "stuff." He summed up his rapture in a single poetic phrase: "The sun is mirrored even in a coffee spoon." 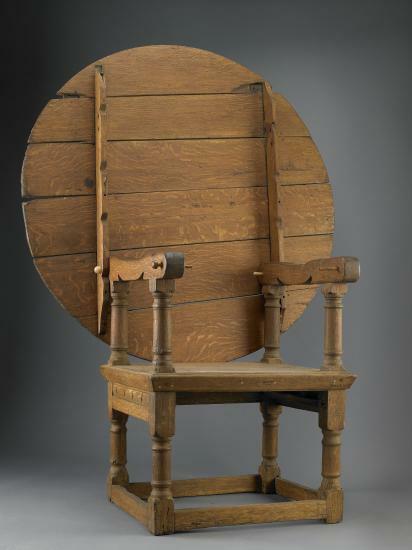 More than meets the eye, this 17th-century chair-table is what its name denotes, convertible from a chair into a table. The rounded top of the table flips up to become the back of the chair. Its dual-function was especially popular in homes with limited space. Upon reflection, I think that Jeremy Alden's chair embodies the same sentiment. Ironically, unlike the mass-produced pencils of which it is built, "50 Dozen" is painstakingly hand-, not machine-made; it was never intended to be the product of an assembly line. Rather, it is cagily crafted as a loving frame for a mass-produced object, the pencil. "50 Dozen" brings together Petroski's admiration for the pencil's construction and uses, Wilson's plea to nurture the hand-mind connection, Thoreau's appreciation for the creativity behind even the most utilitarian objects, and Giedion's almost existential communion with the secret life of things. If the sun is indeed reflected even in a coffee spoon, so can it shine in a pencil chair.